Image classification & content description is incredibly powerful. Cloud-based computer vision services instantly return a JSON-based description of what they see in photos. In this last part, we bring the vital sign check list to life. Artificial Intelligence interprets assessments spoken in natural language. It extracts the relevant information and manages an up-to-date, browser-based checklist. Real-time communication is handled through Web Sockets with Socket.IO. The example scenario focuses on a vital signs checklist in a hospital. The same concept applies to countless other use cases. 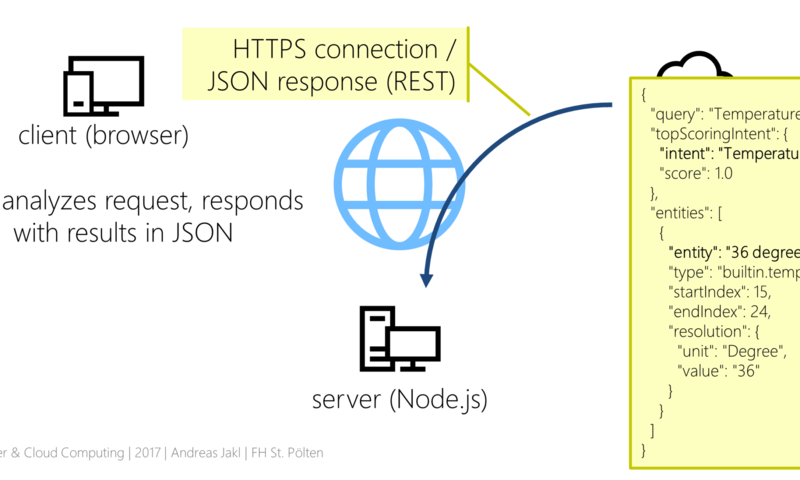 In this article, we’ll query the Microsoft LUIS Language Understanding service from a Node.js backend. The results are communicated to the client through Socket.IO. Training Artificial Intelligence to perform real-life tasks has been painful. The latest AI services now offer more accessible user interfaces. These require little knowledge about machine learning. The Microsoft LUIS service (Language Understanding Intelligent Service) performs an amazing task: interpreting natural language sentences and extracting relevant parts. You only need to provide 5+ sample sentences per scenario. In this article series, we’re creating a sample app that interprets assessments from vital signs checks in hospitals. It filters out relevant information like the measured temperature or pupillary response. Yet, it’s easy to extend the scenario to any other area. During the last few years, cognitive services became immensely powerful. Especially interesting is natural language understanding. Using the latest tools, training the computer to understand real spoken sentences and to extract information is reduced to a matter of minutes. We as humans no longer need to learn how to speak with a computer; it simply understands us. I’ll show how to use the Language Understanding Cognitive Service (LUIS) from Microsoft. The aim is to build an automated check-list for nurses working at hospitals. Every morning, they record the vital sign of every patient. At the same time, they document the measurements on paper checklists. 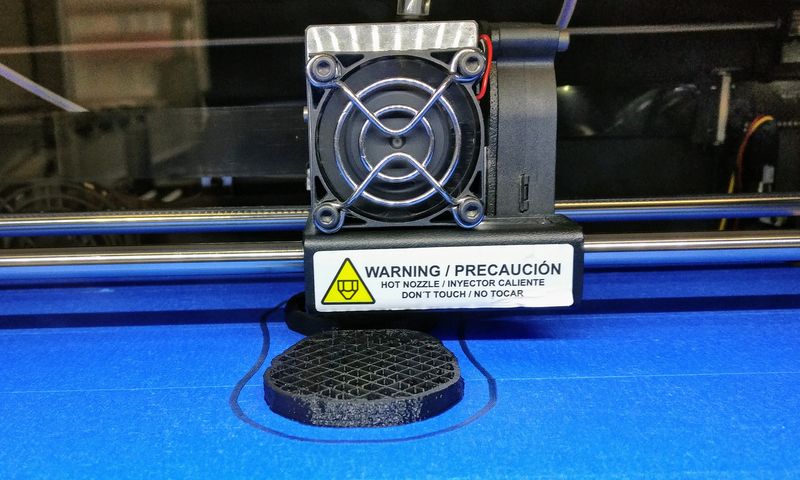 With the new app developed in this article, the process is much easier. While checking the vital signs, nurses usually talk to the patients about their assessments. 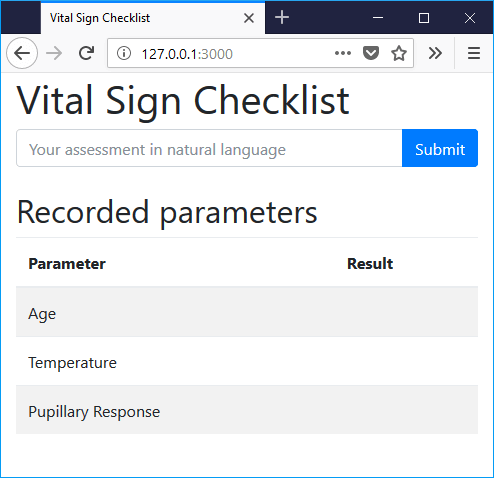 The “Vital Signs Checklist” app filters out the relevant data (e.g., the temperature or the pupillary response) and marks it in a checklist. Nurses no longer have to pick up a pen to manually record the information. 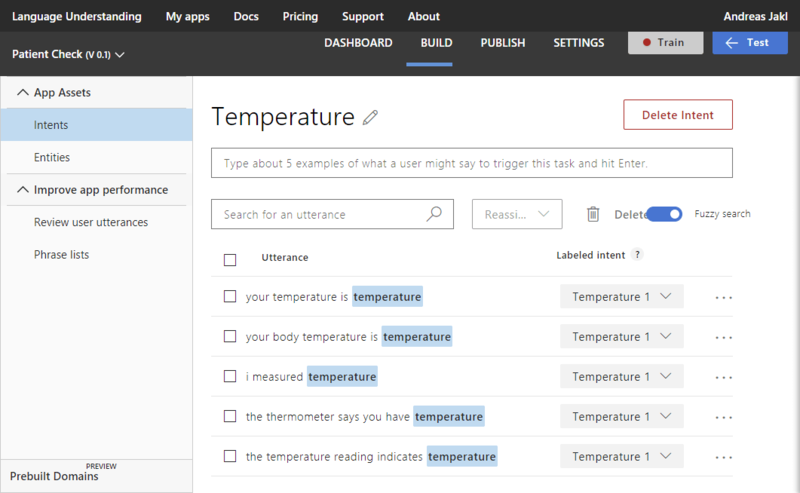 In this article, we’ll create a simple app that uses the natural language understanding APIs (“LUIS”) of the Microsoft Cognitive Services on Microsoft Azure. The service extracts the relevant data from freely spoken assessments. Mobile Apps are no longer simple tools and games. They have grown to amazingly complex systems. Which ingredients are necessary to successfully develop a next generation app? You will need Artificial Intelligence / Machine Learning. Only the best performance will satisfy your customers – or do you want to wait more than a few seconds in a mobile app? 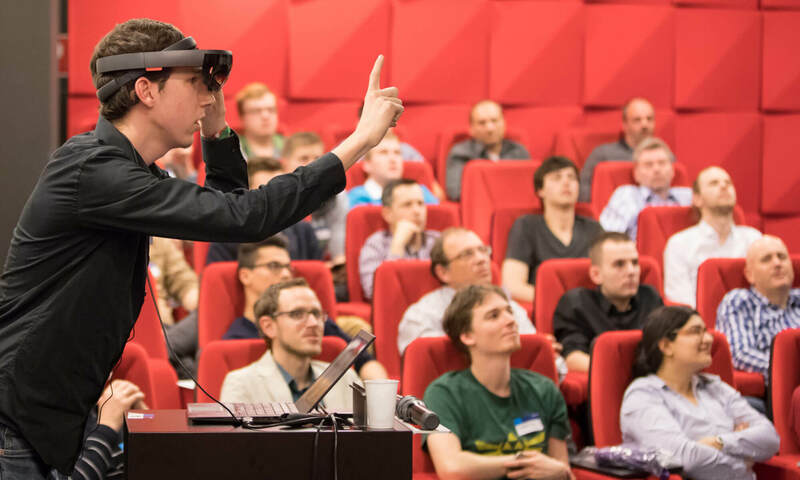 How can you visualize your user interface with HoloLens? What is a Mobile Developer After-Work Event? #mdaw events are mixtures of conferences with more casual meet-ups. Different expert speakers approach an overall topic from diverse perspectives. Afterwards, there’s plenty of time for networking and discussion amongst attendees – with snacks and drinks, of course. The events target mobile developers and decision makers. The goal is to dive deeper into relevant and already known topic areas, as well as to keep up to date with the constantly evolving and changing toolset of the mobile world. In the meantime, we can look back to 14 previous #mdaw events. Topics so far included business apps, digital healthcare, Xamarin, user experience or a Refugee Hackathon. We’re organizing the events with technology partners like Microsoft, Oracle, IBM, the City of Vienna and many others. The community has grown to around 500 attendees, and we continue to get more and more developers on board with each event! Together with Helmut Krämer, I’ve founded the community in 2013 and am proud that it’s still around. We’ve had a tremendous impact on the Austrian developer community so far. With the upcoming #mdaw15, we’re extending the reach geographically and host our first event outside of Vienna, to reach even more developers!